A laptop stand is an often overlooked piece of DJ gear. In addition to clearing up your workspace, they are a critical piece of equipment in keeping your expensive laptop safe and cool. 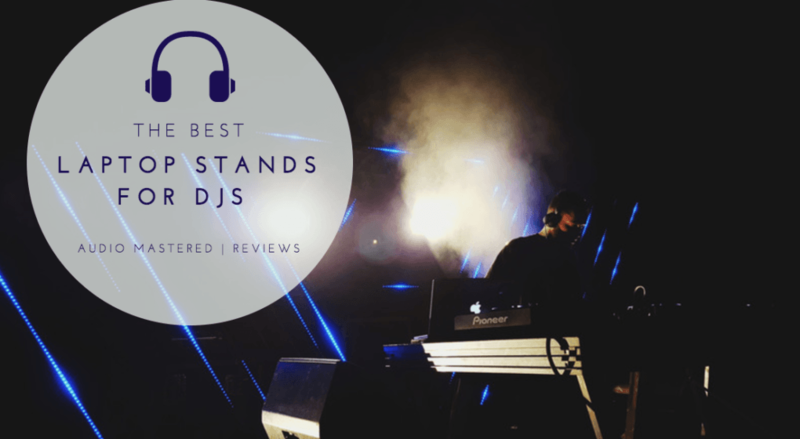 While not the most complex pieces of equipment, there are a few considerations you should be making when selecting the best laptop stand for DJs. We'll quickly run through the most important factors you should be thinking about. We'll then get straight to reviewing the top five laptop stands on the market. We've reviewed a wide range of stands, so you will be able to find something that fits within your budget. Let's get started! You need something that is lightweight and foldable. The laptop stand shouldn't double the weight of your gear bag. 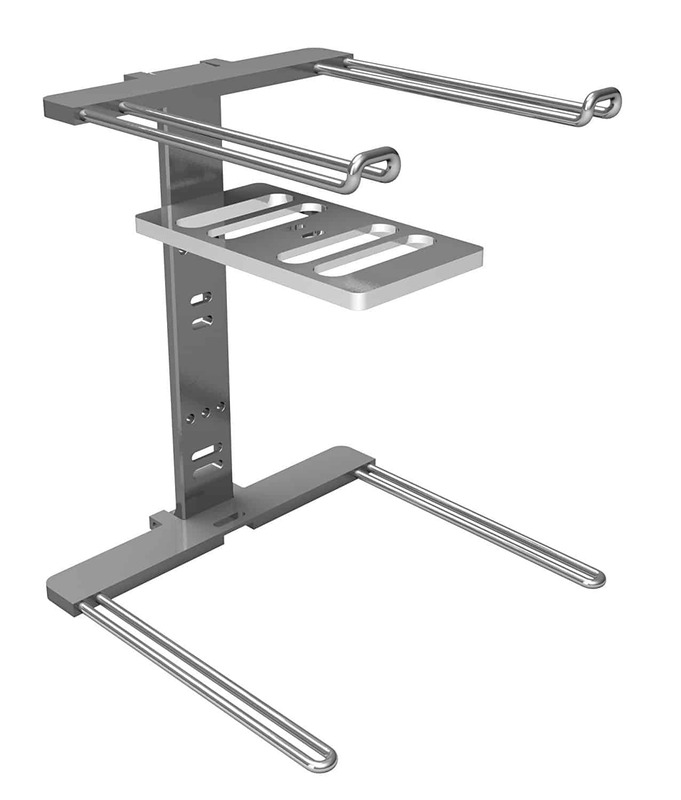 Higher end laptop stands will be made with aluminum and will fold down into a very small package. More budget stands will be made of steel and won't have the option of folding down. 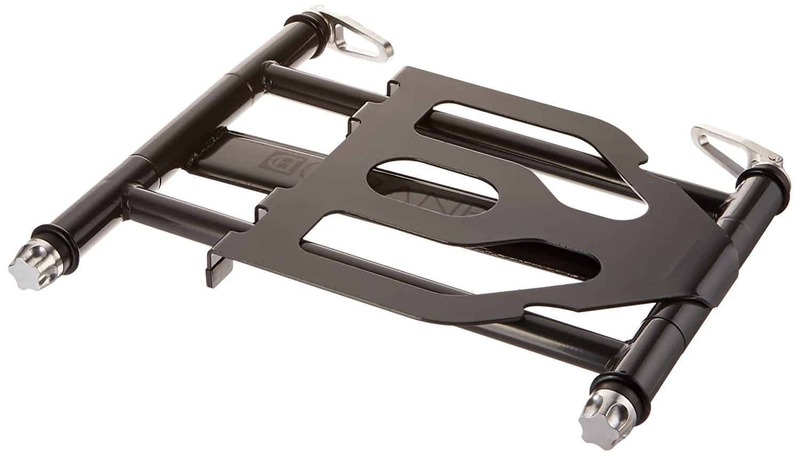 If you are traveling, you should definitely look for a folding laptop stand. If you are just starting out, it won't take long for you to feel the pressure of a quick set change. You'll be under pressure to get your setup up and running while the other DJ is finishing off his set. This usually means assembling everything behind the decks at the DJs feet. This is where you will learn to hate a laptop stand that requires assembly. It's going to be a huge pain to try and turn nuts and bolts in the dark with just your fingers. Look for a stand that only requires unfolding to setup. You'll thank me later. A consideration that is crucial for traveling and permanent setups alike: Stability. You need to have a stable stand. Period. There is no worse feeling than diving after your $2000 laptop as it plummets to the floor. There are various means to accomplish this. If you are a permanent setup you can consider a stand that clamps down to your table. While this is not ideal for the traveling DJ, it does ensure your stand will not tip over given any circumstance. Each stand we reviewed fell on a different location of the stability spectrum. Keep an eye out below. Heat is a laptop killer. Having the convection flow of air removing heat from the bottom of the laptop is important for the health of the laptop. Placing your laptop on an insulating surface will only decrease the performance (not ideal in front of hundreds of people). Look for a stand with an open bottom concept. The stand should be lightweight and able to fold down into a small package. The stand should be quick and effortless to setup. Should have an open bottom concept. Below you will find our top picks for the best laptop stand for DJs. They are ordered from the least expensive to the most expensive. First up: the PYLE-PRO PLPTS25. This unit is budget friendly and sturdy. 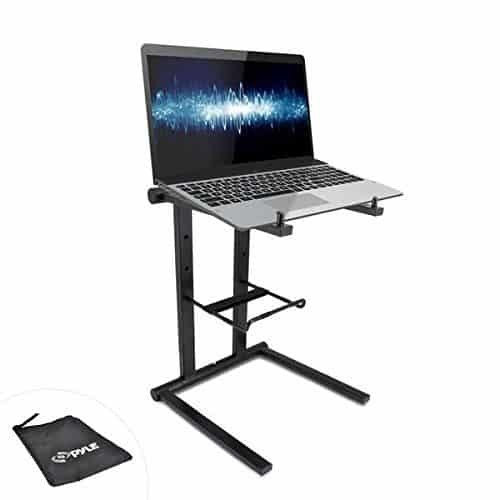 It's by far the cheapest DJ laptop stand on our list. This will be good for anyone looking for a very basic stand without any additional moving parts or features. As this stand does not fold down and is quite heavy, we'd recommend only using it for setup installs rather than a portable setup. It does offer some adjustability, which is a nice feature. It also uses an open design, which allows for good air circulation (essential for keeping the temperature of your laptop down). This stand will hold any laptop under 8 lbs (most). There have been no complaints of a lack of stability, or a problem fitting laptops with the stand. It is actually very easy and fast to setup, just not very portable. Budget friendly and sturdy. Does not fold down. ​The only real downside to this stand is the heavy weight and the lack of portability. This stand would be a pain to carry around if you are moving venues constantly. Bottom Line: A great budget friendly option for someone looking for something sturdy and isn't worried about portability. Next up: the Pyle PLPTS55. Pyles higher end offering comes with a few more bells and whistles. While it is more expensive than the 25, the PLPTS55 gives you the portability and adjustability that traveling DJs need. It uses a telescoping height adjustment, great for fine tuning your preferred height. 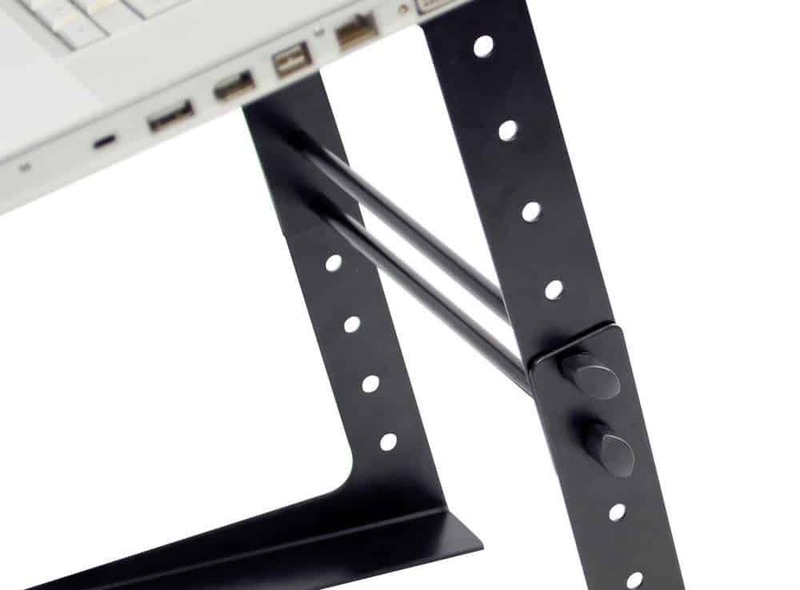 You are also able to adjust the shelf angle, and it is the only stand that allows you to turn the laptop tray. It's also lightweight and foldable. Hugely important for those looking to bring it from gig to gig. It's also very fast to setup and the legs will slide under a mixer rack stand. The only negative feedback is some users found it to be slightly unstable with heavier laptops. While okay for a laptop, you aren't going to want to use this with a controller. The pivoting feature does not have a locking mechanism, therefore it can be difficult to prevent the stand from turning unintentionally. Portable, lightweight, and adjustable. Slightly unstable. If you are not completely sold on the Crane or don't want to spend the extra $20, this is our second recommendation. It checks off a lot of things you should look for in a laptop stand. 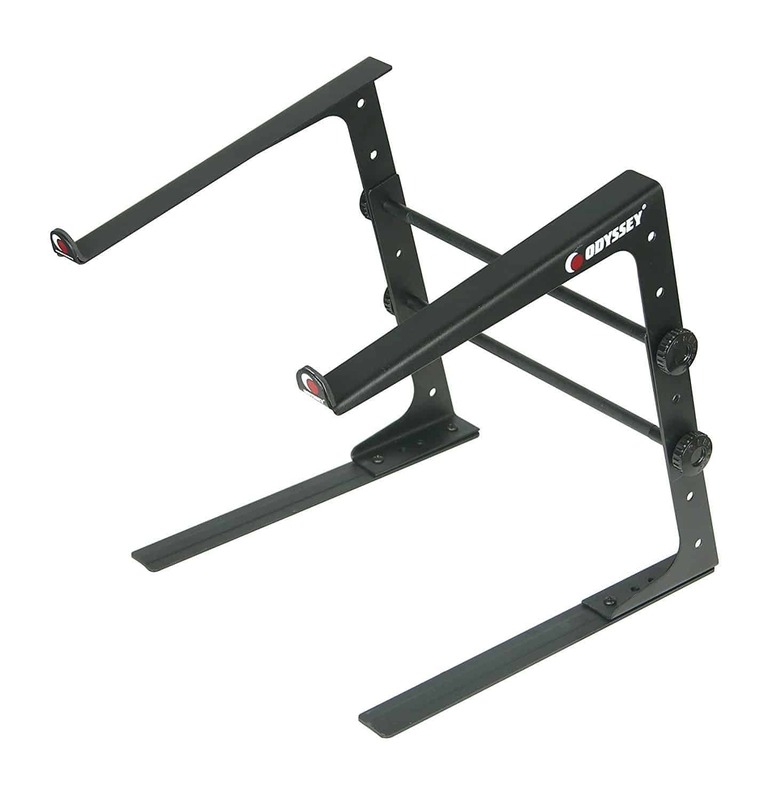 The Odyssey LSTAND is another very popular laptop stand for DJs. While it is good for certain situations, we don't recommend this stand for the traveling DJ. For one thing, it's very heavy. Stuffing this in your gear bag is going to be very noticeable. Additionally, you are going to need to break it down and rebuilt it (takes about 5 minutes) every time you change venues. This can be a pain crouching down behind the deck trying to tighten nuts and bolts. Once clamped down, it is very stable. This makes it perfect for permanent installs. Although, you aren't getting all the adjustment options that its competitors provide. You only get vertical height adjustment, with no laptop base angle adjustment. Heavy and sturdy. Good for permanent installs. Not great for traveling. It's very similar to the Pyle 25, but comes with clamps. 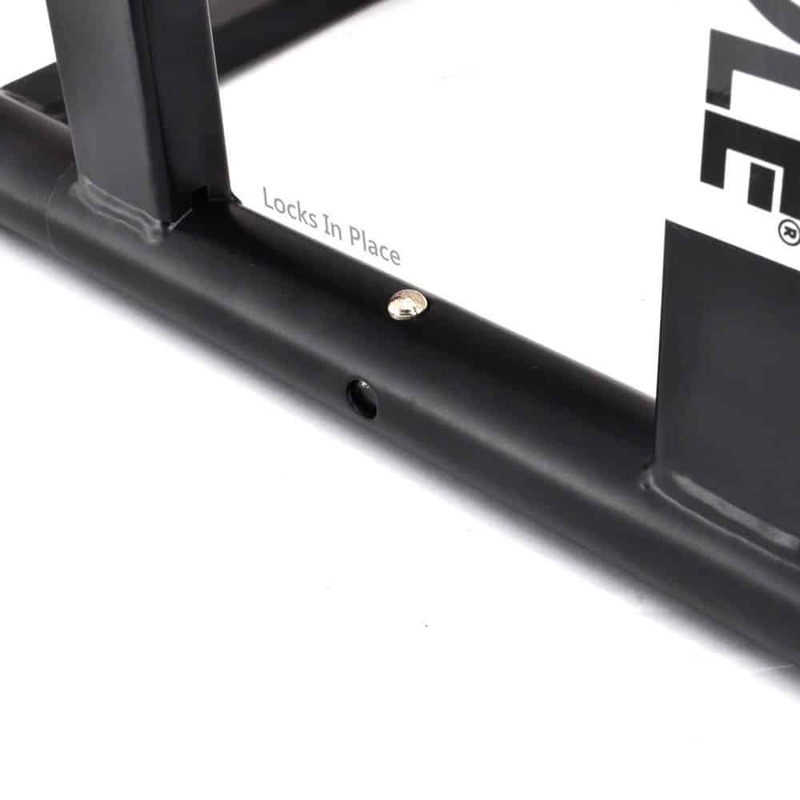 If you mind not clamping your stand down, we recommend just going with the Pyle 25 (it's half the price!). Bottom Line: Decent for permanent installs. Skip if you plan on traveling with it. Go with the Pyle 25 if you don't want the clamping option. The Crane. This is out top choice. It does well will with everything a DJ will need in a laptop stand. While it's not the cheapest option on our list, we feel the benefits it offers is worth the price difference. First off, it folds down quickly into a very discrete package. It can be tucked away into your gear bag easily and quickly. I won't take up much weight or space. When it comes to setup, it is one of the fast out of our competitors. It's also possible to adjust the height and the angle of the tray. The stability is actually quick good considering it doesn't lock down to the table. It's even stable enough to use as a tray for your mixer if you choose. ​It's manufactured using aircraft-grade aluminum (lightweight). 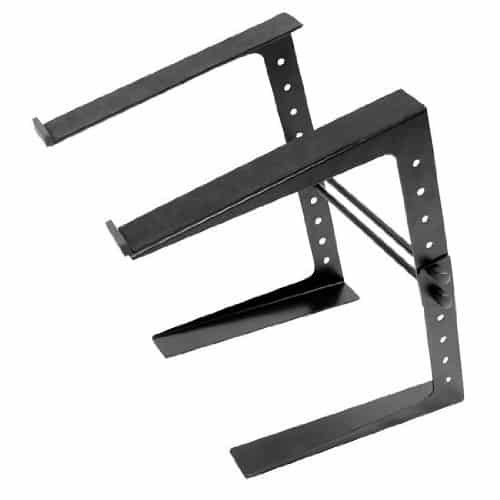 If something does go wrong with your stand, you are covered by a 1-year warranty on the product. Does everything well. Highly recommended for the serious DJ. There are no real negatives to this stand. The only potential issue is if you use the locking cams incorrectly. Once you read the user manual and have a good understanding of how these work you'll be fine (they are exactly the same a quick releases on bicycles). Bottom Line: The best option for the serious DJ. Does everything well. The last and most expensive option on our list. 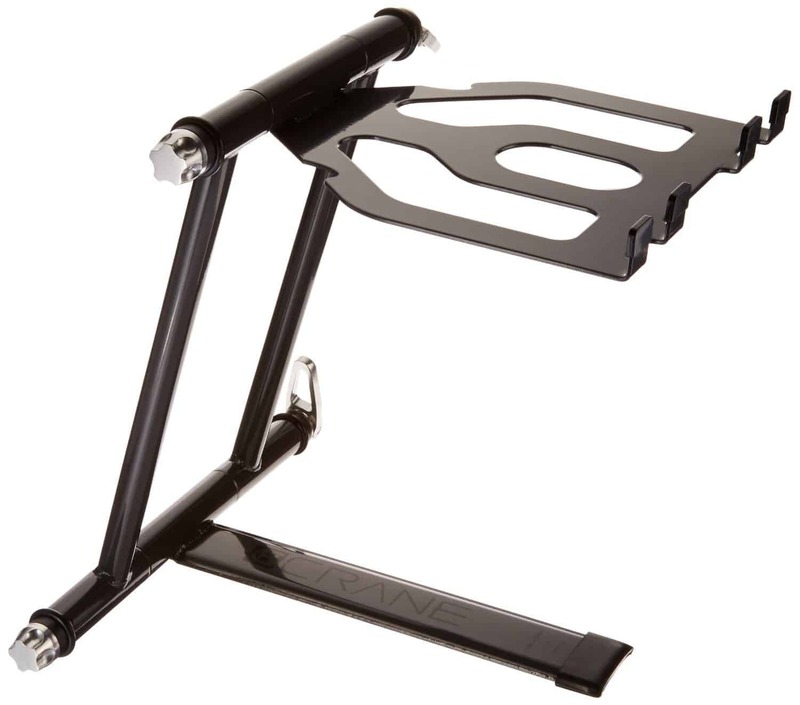 While this stand isn't terrible, there have been a number of complaints of lack of stability and adjustability. If you don't have anything to attach the plastic ties to, this stand can be slightly unstable (although some are comfortable using the stand without them). You are not able to adjust the angle or height of the laptop tray in any way. Although, it does come with an adjustable mini-tray for your external hard drive. It scores well on portability, breaking down into a small, 12'' carrying case. ​It's also very fast to unfold and set up. Similar to the Crane, the stand is made of aluminum, making it incredibly light. Lightweight, portable, and fast to setup. Not adjustable, and slightly unstable. Not worth the price. ​Again, this stand is not terrible and does a good job with some of the things a DJ will need. However, because it is significantly more than the other stands on our list, we recommend just going with the Crane. Bottom Line: A decent option. We recommend going with the cheaper option of the Crane.